A Venetian window (alias Serlian) is a large tripartite window which is a key element in Palladian architecture. Although he did not invent it, it features largely in the work of the Venetian architect Andrea Palladio (1508–1580) and is almost a trademark of his early career. The true Palladian window is an elaborated version. The Venetian window consists of an arched central light flanked by two shorter sidelights. Each sidelight is flanked by two columns or pilasters and topped by a small entablature. The entablatures serve as imposts supporting the semicircular arch that tops the central light. In the library at Venice, Sansovino varied the design by substituting columns for the two inner pilasters. To describe its origin as being either Palladian or Venetian is not accurate; the motif was first used by Donato Bramante and later mentioned by Sebastiano Serlio (1475–1554) in his seven-volume architectural book Tutte l'opere d'architettura et prospetiva expounding the ideals of Vitruvius and Roman architecture, this arched window is flanked by two lower rectangular openings, a motif that first appeared in the triumphal arches of ancient Rome. Palladio used the motif extensively, most notably in the arcades of the Basilica Palladiana in Vicenza. It is also a feature of his entrance to Villa Forni Cerato. It is perhaps this extensive use of the motif in the Veneto that has given the window its alternative name of the Venetian window; it is also known as a Serlian window. Whatever the name or the origin, this form of window has probably become one of the most enduring features of Palladio's work seen in the later architectural styles evolved from Palladianism. According to James Lees-Milne, its first appearance in Britain was in the remodeled wings of Burlington House, London, where the immediate source was actually in Inigo Jones's designs for Whitehall Palace rather than drawn from Palladio himself. The Palladian window or "Palladio motif" is Palladio's elaboration of this, normally used in a series. It places a larger or giant order in between each window, and doubles the small columns supporting the side lintels, placing the second column behind rather than beside the first. This is introduced in the Basilica Palladiana in Vicenza, where it is used on both storeys; this feature was less often copied. Here the openings are not strictly windows, as they enclose a loggia. Pilasters might replace columns, as in other contexts. Sir John Summerson suggests that the ommission of the doubled columns may be allowed, but "the term "Palladian motif" should be confined" to cases where the larger order is present. A variant, in which the motif is enclosed within a relieving blind arch that unifies the motif, is not Palladian, though Burlington seems to have assumed it was so, in using a drawing in his possession showing three such features in a plain wall (see illustration of Claydon House right). Modern scholarship attributes the drawing to Scamozzi. Burlington employed the motif in 1721 for an elevation of Tottenham Park in Savernake Forest for his brother-in-law Lord Bruce (since remodelled). 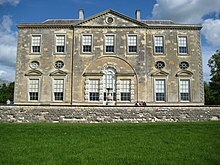 Kent picked it up in his designs for the Houses of Parliament, and it appears in Kent's executed designs for the north front of Holkham Hall. Wikimedia Commons has media related to Category:Venetian windows.